Alison McAlpine’s Cielo is visually breathtaking, but contemplative to the point of being slow. 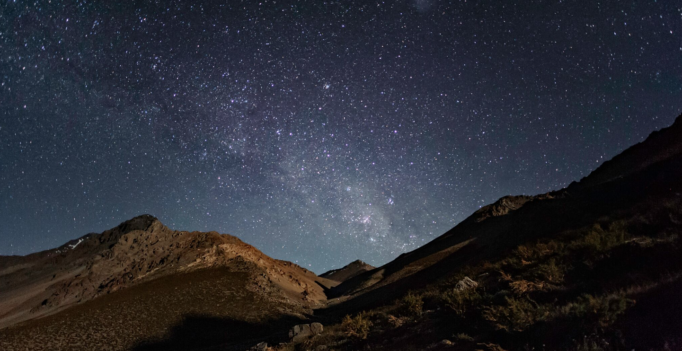 Directed, written, and narrated by McAlpine, the documentary takes the viewer to the Atacama Desert in Chile – one of the world’s best stargazing locations – to ask everyone from Chilean residents to scientists about their relationship to the star-crowded sky above. The result is a likeable mix of characters from various walks of life sharing the theories, myths, and superstitions of the stars against the backdrop of intimate crackling fires and awe-inspiring valleys. Yes, the landscapes are striking and the stars are cast brilliantly alongside mountains and reflecting water, but Cielo is a much more mellow watch than it is a riveting one. Science plays a part in the conversation, but the scientific is blended elegantly with the spiritual in this doc, making for a diverse survey of how people today – and in generations past – have connected with the night sky. McAlpine also manages to strike the appropriate balance between dialogue, narration, and wordless presentation of the naturally sublime. Of course, taking in the night sky is always better when you’re actually there, and just like photographing the moon doesn’t tend to capture its splendour, there’s only so much film can do when dealing with one of the most historically enchanting features of the natural world. It is probably crucial that this documentary be viewed on the big screen. Cielo is a nice film for a quiet night in, but it’s not exactly action-packed. That said, at 75 minutes, the runtime is exactly where it ought to be. Though it may sound unflattering at first, this would be a lovely movie to fall asleep to.